Madeleine Park spent much time studying and modeling elephants over her lifetime. 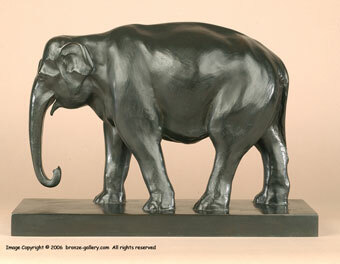 She spent many years traveling with the circus where she could study the elephants and sculpt them from life. 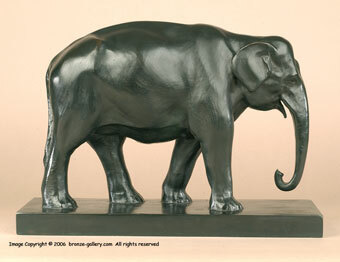 Several of her elephant sculptures were cast in bronze. This bronze is a large powerful model of a standing Indian Elephant. It is cast by the Preissman Bauer Foundry in Munich Germany and probably dates from the mid to late 1920s when she was in Europe. Signed on the base and stamped "PB&Co Munchen Made in Germany", it has a rich dark brown black patina. She must have been very fond of elephants and on August 23, 1953 Madeleine Park appeared on the What's My Line TV show. Her occupation that was to be guessed was "Buys Elephants for Circuses".